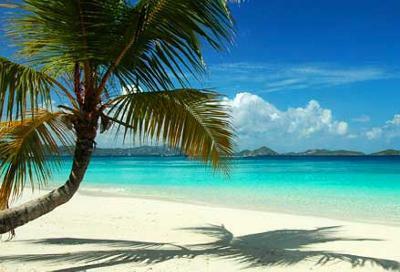 Solomon Beach is the most secluded beach in St. John. You can only access it via a long, downhill trail from a parking lot, about a mile walk. 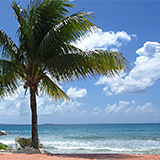 It is pure, unspoiled, white sand with crystal clear blue water and decent snorkeling. When we were there we only saw 2 other people and we felt like we owned it. Magnificent. Nori's Reply: Sounds just like Anguilla's beaches! I loved those curved coconut trunks -- I think they're called "turtleback coconuts." St. John is an island we've yet to visit in the Caribbean. We almost went this past summer, but headed out to St. Lucia and Barbados instead. The island sounds wonderful. 3/5ths of it are protected as national park. You can only reach St. John by boat from St. Thomas, Tortola, or some of the other islands. It's smaller than Anguilla in both size (20 sq mi vs 35) and population (4,000 vs. 15,000). 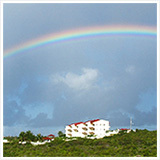 Like Anguilla, it features high-end resorts and world-class beaches. We'll have to do a day trip to St. John next time we're back home in Anguilla. Friends who've been to St. John say it's varies from ritzy to totally undeveloped and protected. I like quiet islands, but this one may just be too quiet for me. Still, it's one I want to visit! More information on St John here (Wikipedia). I have visited this beach last year along with my wife. That was at the time of our honeymoon trip. Really amazing! We have spent a week and we got so many unforgettable moments. Solomon beach was really fantastic!